Organizing your media on your computer is like building a house: it is a complex undertaking requiring an efficient plan, good photo management tools and lots of patience. However, even if you get the right tools and you learn how to use them, without a proper blueprint and building plan you would still not be able to build a house properly. What does a blueprint or plan give you? Simply put, it gives you direction…actually it gives you the right direction towards your goal. Let me take the house building example further and apply it to digital photo organization. Does the house need to have plumbing? Does it need electricity? How many fuses does the fuse box need? What is the water pressure needed? How about connecting to the city sewer line? How about meeting the building code for the city? Of course, of course…a house needs all that! So, now imagine that I buy all the new fancy tools needed for building my new house: electric drills, power saws, trench diggers and so forth. Then I learn how to use each one of them, so I’m pretty good at using them. I’m ready to start digging, cutting, building…right? If you don’t have a blueprint, where do you start digging? Where do you start pouring concrete? Sure you can do a small job like cutting a pipe with your fancy new saw, but unless you know where that piece fits, your plumbing come out all tangled up. So when building a house, it’s not all about having the best tools and knowing how to use them well, but having an efficient building plan puts all the pieces together so a house will actually look and feel like a house. As a summary, the tools and skills are secondary to the house blueprints, the tools are a means to a good end. 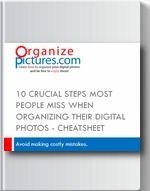 Ok…you got it…but what does this have to do with organizing your digital photos on your computer? Well…it does! Because the most important thing is going you need for organizing your digital media is NOT the latest software but rather having an efficient system that pulls together your cameras, phones, computers and software and allows you to organize, find and use your pictures when you need or want to. You always need to remember that you are learning how to organize your digital photos so you can be free to enjoy them! In the same way, when it comes to organizing your digital media, simply buying the latest software and learning how to use it does not solve your media organization problem. Without an efficient plan for organizing your media, all the latest software and the many hours spent to learn all the buttons and settings will amount to very little towards actually creating an efficiently organized media library. Having a good plan and an efficient system for organizing your media however, is a lot more important and it does not really depend on what tools you are using. The tools and your skills keep changing but your organization system should stay the same regardless of the tools you use, because it provides the right direction towards the right goal. With all that being said, let’s explore some of the most misleading myths I have found while helping photographers organize their digital photos for the last 10 years. Truth: Most photographers think that once they find the right software and buy it, all their media organization problems will be solved. This is simply not true. Having a good software program for managing your photos can help, but without an efficient plan you will continue to be lost. Continuing with my house building metaphor, it’s like buying a new fancy electric drill but not knowing where to drill holes for your plumbing. Most photographers focus on the tool instead of what to do with the tools they use. Looking for better software should come after having a clear and efficient plan in place. Truth: Unless you are using iPhoto/Photos on the Mac, that statement is not true. Your photo management software only shows you the photos you have on your hard drive. If you have set up things correctly, You should be able to use any other software to see the same photos. So your photos are on the hard drive and not inside your software. You control which folders contain what photos and how they are organized, not your software. Again…if you’re not using iPhotos/Photos on the Mac. If you are using iPhotos/Photos then you are at the mercy of your software, as it is taking over your photos and doesn’t give be you any control. Truth: You may have learned how to share your photos using Google Photos, Apple iCloud or Microsoft One Drive. However, these services do not really help you organize your growing collection of photos…they only help you share what you have. If you have a mess on your computer, you will have a mess in your sharing service. Sharing photos is great only if you can find the pictures you want to share and don’t mix everything up in the process. Truth: Organizing your digital media is not a simple task. Understanding your software will definitely help, but there are no magic tricks to make this task a breeze. Having an efficient system to organize and use your photos will get you much further than any particular software feature. Truth: Since the quantity of personal photos and videos is increasing so quickly, the risk for losing precious memories increases as well. Backing up your media at least on a good external drive is probably the most important investment you will ever make. In addition you would be very wise to backup your media online using an inexpensive and efficient cloud backup service. Backing up your media at least on a good external drive is probably the most important investment you will ever make. How do you organize your photos the right way? Don’t focus on finding the next best software program! Focus on having an efficient and repeatable system, regardless of the software you’re using. Remember my acronym: STORE? Shoot, Transfer, Organize, Retrieve and Export. Each step of my system supports the next one so that I’m never lost as to where my new pictures need to go or where some particular pictures actually are. Whatever system you have, make sure that it takes into account all your photos sources, organizes them in a simple and efficient way so you can find them when you need to so you can actually enjoy your pictures. Vlad, I completely agree to what you pointed out here. That, having an efficient system to organize photos is more important than which software you are using to do so. I would like to introduce you to Tru – http://www.truorganizer.com – an easy to use tool to streamline the photo organizing process. It lets you aggregate all photos from all sources, de-dupes them and organizes them in a consistent MMYYYY folder format. Fast and simple – would love to hear your feedback. Thanks for this reminder – I started out using Picasa and got pretty good at it. Now that it is being fazed out, which is your favorite program? Google Photos, iPhoto, or something else? Thank you! Angela…good question! Well, for the Mac the only options are Picasa (still) and Adobe Lightroom. For Windows, Picasa is still running well, but there are more options like the free ones: FastStone Image Viewer and XnView or commercial: Adobe Lightroom and Zoner. As far as Google Photos goes, I love it but only for sharing my favorite photos, not really for any organization.